Dr. Nelson loves working with dental patients to create beautiful, healthy smiles they can feel confident in sharing. 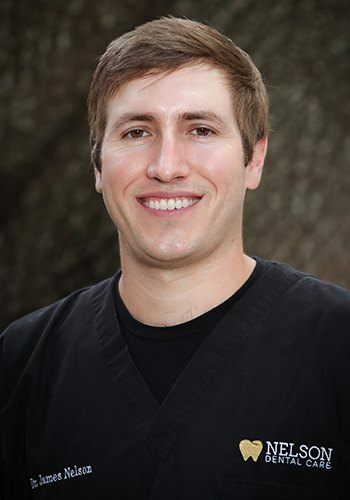 He’s been serving Louisiana residents since 2013, and he looks forward to continuing to provide outstanding, high-quality dentistry for years to come. A native of Baton Rouge, Dr. Nelson graduated from Louisiana State University at Baton Rouge and went on to pursue his doctor of dental surgery at the LSU School of Dentistry in New Orleans. Additionally, Dr. Nelson is oral conscious sedation and Invisalign certified. He completed the Heartland Aesthetic Continuum and has studied at the Spear Institute in order to provide a wider range of high-quality dental services for every patient he treats. As an active member of the professional community, Dr. Nelson maintains membership in the American Dental Association, Louisiana Dental Association, New Orleans Dental Association, and the Academy of General Dentistry. Dr. Nelson is happily married to his wife, Courtney. They have a cat named Lucy, a dog named Charlie, and when time permits, he enjoys running, reading, and watching LSU and Saints games. Dr. Nelson also loves to play guitar, and he was in a cover band while in college.